Data security is one of the most important part of computing since its beginning days and going to be more and more important, as we are going to be far more digitized. So, what is encryption ? Briefly encryption is a mix of math and technology to prevent unauthorized access of secret and valuable information. Somewhat like locking money, jewellery etc. inside an iron safe, but digitally. Encryption is extensively used by security agencies, military, business organizations, hackers, even by criminals to safeguard their privacy and protect valuable information. But why data security and encryption is necessary for normal users like you and me ? Simply to protect us, probably you are aware of what could be done with with your email and facebook password, hard earned research papers, banking password, financial information etc. etc. Before going further, it's good to know a little more about eCryptfs, The word eCryptfs stands for Enterprise Cryptographic Filesystem. A filesystem level encryption tool, available with Linux kernel as a special stacked cryptographic file system driver. Konw more you may read the Wikipedia article and Arch wiki. 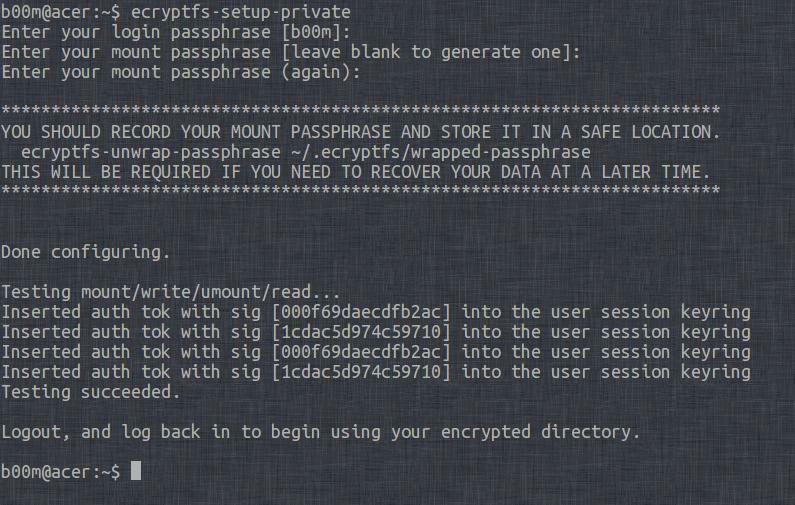 Default eCryptfs setup automatically mounts the encrypted filesystem after user log in, so keep your password secret. Allways take a backup of the ~/.ecryptfs/ folder and remember your log in password, whith out them encrypted data recovery is a real pain. Lets encrypt our valuable information with the help of eCryptfs. This tutorial is tested on Debian and Ubuntu. However it should work fine on any other GNU/Linux distribution like Ubuntu, Linux Mint, Fedora, Arch Linux etc. Ecryptfs is already installed in Ubuntu since a long time, to provide encrypted ecryptfs ubuntu home directory. to install in Debian, just run the command bellow. Load the ecryptfs kernel driver, this is only for the first time, loads automatically after next reboot. This is the basic step to create an encrypted private directory, where you can store your private information securely. This step will create two folders in your home directory named Private and .Private. Where .Private folder contains the encrypted data and the Private is the mount point, i.e. where the decrypted data is available. enter your login password, then enter a mounting password or leave it blank to automatically generate a secured one , log out and log in again and done ! Now move your secret documents to the Private folder. Now the encrypted filesystem is mounted, to mount and unmount the encryped Private directory, use the commands bellow. To encrypt any other directory, simply move the directory to the Private directory, you may create a link to that directory for easy access. By default the Private folder is automatically after log in, to avoid this annoying feature, pass the --noautoumount argument during setup, like bellow, this setup will also un mount the Private folder after logout. To setup an encrypted home directory without any hassle, log out from current session, log in as another user (i.e. as root) , install rsync and lsof , and run the command as root, ecryptfs-migrate-home -u username . Now its your turn, secure your sensitive data and stay safe, hope this tutorial will help to encrypt them with eCryptfs. If you need any further assistance just leave a comment, we’d be happy to assist you.